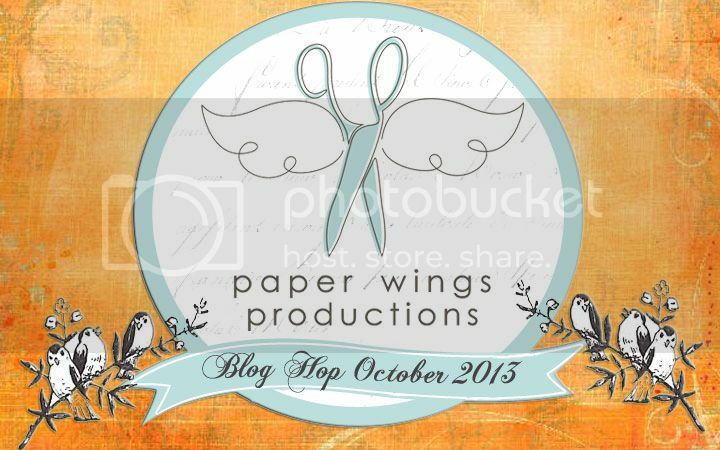 WELCOME to Paper Wing Productions' October Design Team Blog Hop and Giveaway! If you've arrived here from Norma's blog, then you're in the right place. 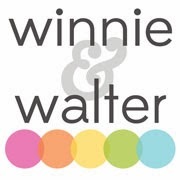 If you’re just stopping by for a visit, please CLICK HERE to start from the beginning. This month we’re having some wicked fun but don't be scarred because our creations will be a treat for your eyes! Get comfy and prepare to shriek with delight!! 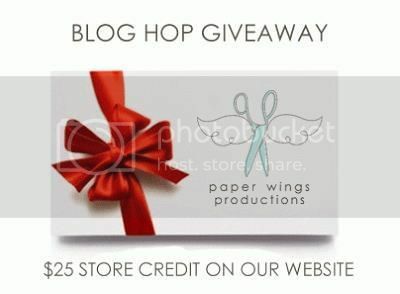 This month’s main prize is a gift certificate to the Paper Wings Production’s online store (you could pick up the new devilishly delightful Nesting Components Mixed Media Kit). The winner will be announced on Tuesday, October 8, 2013 on The Aviary­. Ready to see what trick or treat I have in store for you? I chose to do a canvas panel again. I love the flexibility and possibilities with one of these canvas panels plus they are a bargain when you buy them on sale at Michael's. 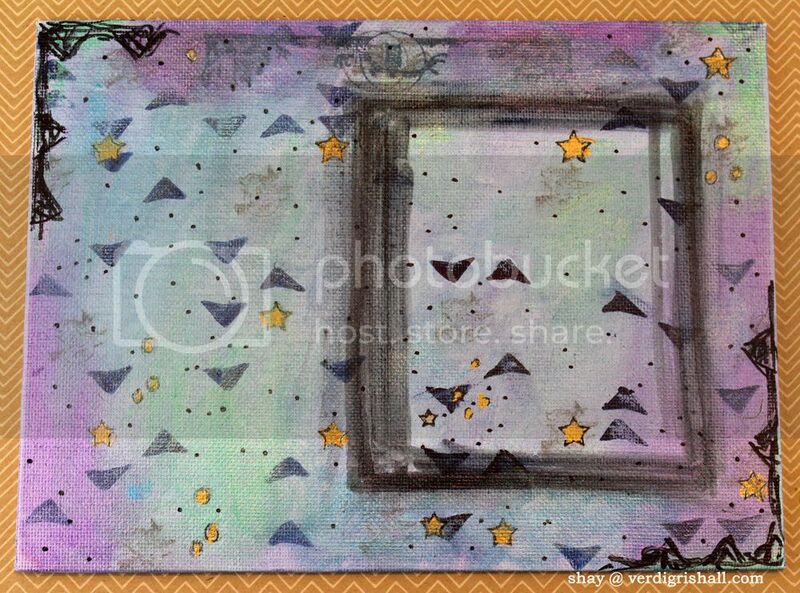 A bonus for stampers, the canvas panels are a firm surface that is easy to stamp upon. I started by scribbling on some metallic blue, green and purple Gelatos directly onto the panel and then spread the color with a wet brush. Next I added some triangles using the Stamper's Big Brush pen and a mask randomly on the panel. In grey ink I stamped the little witch from Witchy Halloween or Witchy Greeting randomly over the panel and dabbed off any excess ink for a faded and subtle look. Using a gold metallic pen and a star mask I added some stars which I also outlined with a black pen. I added some messy sketching with a Sharpie in two corners. I also stamped the owl border from Halloween is Here on the top of the canvas in grey and then navy inks. Where I planned to put on a focal point I drew a box to create a shadow. For my focal piece I began with one of my favorite ladies: Heather (to get Heather and all her friends pick up the Women Melange set) to create a witch. I know, I know wicked witch is so cliché, but I honestly could not help myself! I stamped Heather twice, once with navy ink and once with a light grey ink. Using the navy inked image I colored in Heather's hair in dark blue (why shouldn't a witch have deep dark blue hair? Just seemed right to me) and her dress. On the light grey image I colored in Heather's skin and face making sure to make her more eerie and creepy by giving her outlined orange eyes. I cut out Heather's face and neck from the navy image and placed the grey Heather under the navy one. For a witch's hat I cut one out from cardstock, added a strip of green striped washi and painted it black to transform Heather into a proper witch. I decided I wanted Wicked Witch Heather framed. I traced a polaroid frame onto some green polka dot patterned paper, cut out and placed Heather inside using dimensional adhesive. 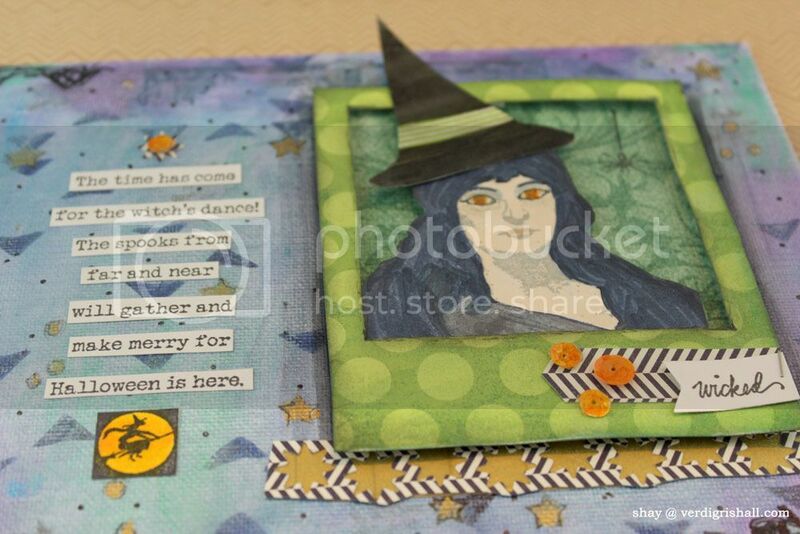 I backed Heather with some green damask patterned paper which I stamped with the cute little spider from Witchy Halloween or Halloween Friends in black ink. To dress up the frame a little I added the little wicked (in case you were unsure of the wicked theme) from Witchy Halloween or Witchy Greeting, some patterned paper and sequins that I altered using a handy orange Copic (love my Copics!). Under Heather I added a strip of patterned paper cut with a stars die with the negative space backed with gold washi. I stamped the poem from Halloween is Here or Time Has Come onto white cardstock and then cut out each line and added them to the left of Heather. Above the words I added a die cut star accented with a sequin. 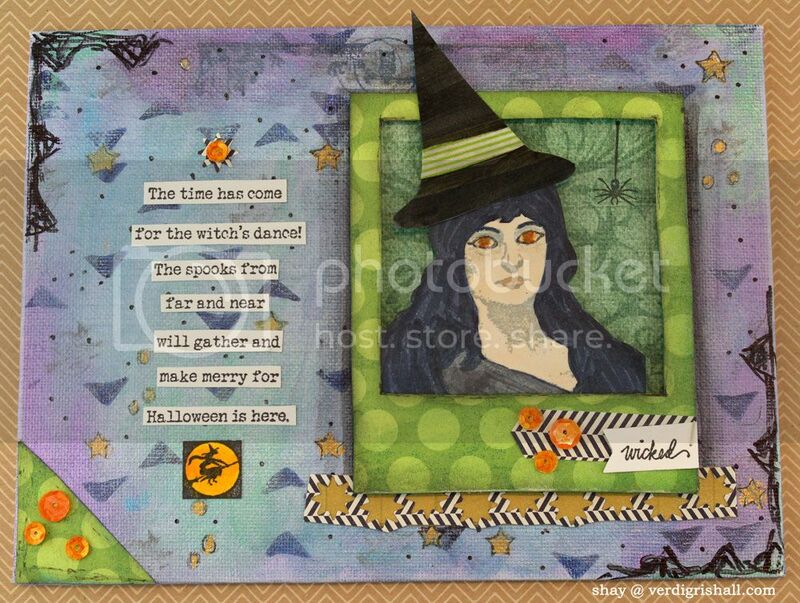 Under the words is the witch square from Witchy Halloween or Witchy Greeting stamped in black ink and colored in with yellow and orange Copics. If you haven't fallen asleep from reading my essay long description of what I did, I thank you for your strength and fortitude! You also deserve a treat and I have just the thing for you: head on over to Amber's blog! 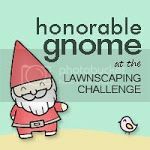 Thank you so very much for sweeping by today and have a wickedly awesome day! 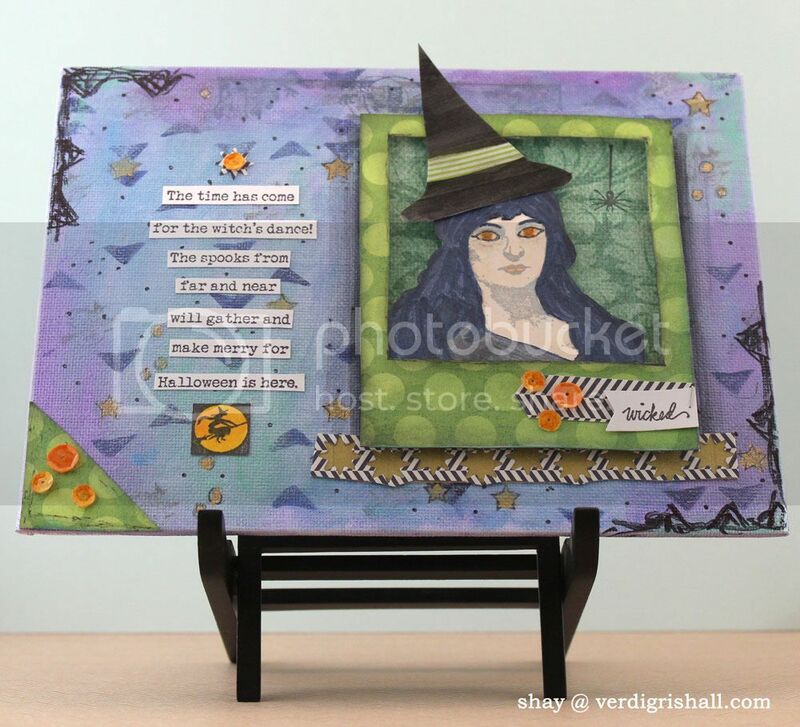 Gorgeous canvas project...love how you turned Heather into a witch lol! Great colors and details! Hi Shay, I really really liked your project and thanx for explaining how you did it, love the image and those tiny sequins !! Great canvas Shay!! Love the colors and all the stamping!! Very Wicked!! Great piece, the stamping looks wonderful and very cute poem! Awesome project great ideas . Thanks for sharing. So much detail work!! Looks great!! 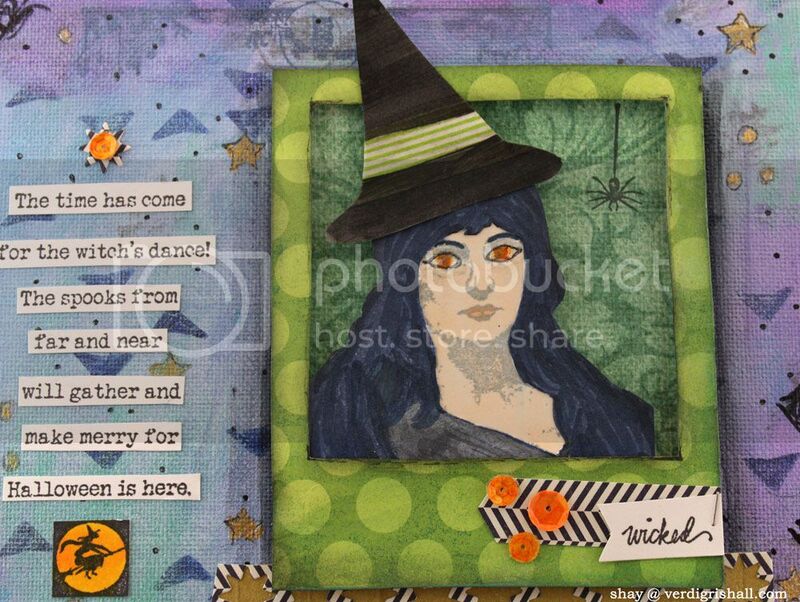 Too cute, love the background and the little wicked label you added to you photo frame! This is such a great project. So creative! I never know what to do with my "women" stamps - the hat makes such a big difference. And love the doodlings + sequins.